I teamed up with a few of my favorite authors to bring you a chance to win $300 ... Just in time for back to school! Plus, you'll receive these six books free when you sign up for our newsletters! You can sign up for the newsletters through the rafflecopter. There are lots of ways to enter (no purchase necessary). The more things you do, the more chances you'll have to win! Enter by clicking on the rafflecopter link below. You can get points by sharing the giveaway on Instagram, Twitter, or Facebook, or following your favorite sweet romance authors on social media. Below are sample posts to share on Twitter, Facebook, and Instagram. You can also use the graphic above or post yourself reading one of our books. 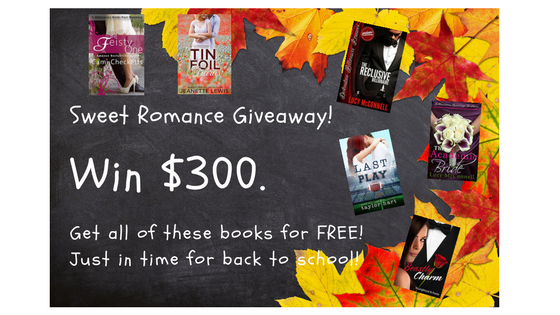 Facebook: Win $300 just in time for back to school with your favorite sweet romance writers - Taylor Hart, Lucy McConnell, Jeanette Lewis, Jennifer Youngblood, and Cami Checketts. Post a picture of yourself or share this one and enter to win on the rafflecopter here. Thanks for this great chance. Love your books. That you so much for the chance to win this great contest. Thank you for sharing! Make sure you enter on the rafflecopter. I love your books, thank you for the chance.